Omega-3 fatty acids are healthy fatty acids primarily found in marine animals and plants. Unlike saturated fats, omega-3s are associated with a wide range of health benefits. They've been helpful in the treatment of many different diseases and can even help prevent cancer. 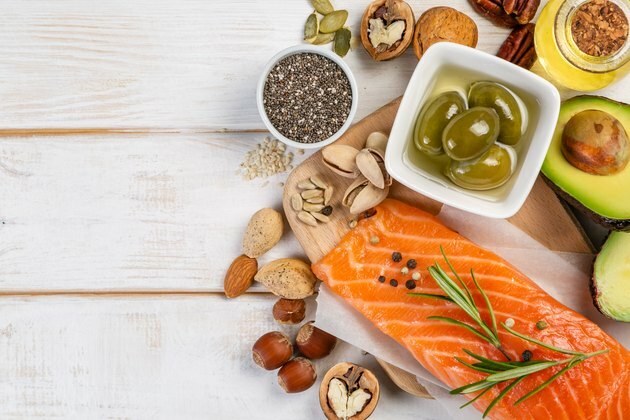 Omega-3 fatty acids are short-chain and long-chain polyunsaturated fatty acids that are sometimes referred to simply as PUFAs. These beneficial fatty acids can be found in marine plant and animal sources, meaning that the omega-3 supplements you may be taking are made of fish oil or algae oil. There are three main PUFAs that you consume when taking omega-3 supplements: DHA (docosahexaenoic acid), DPA (docosapentaenoic acid) and EPA (eicosapentaenoic acid). Omega-3 supplements typically focus, however, on EPA and DHA. The amounts of these can vary a great deal from manufacturer to manufacturer and among supplement types. A typical fish oil supplement provides about 1,000 milligrams of fish oil, containing 180 milligrams of EPA and 120 milligrams of DHA, but extra-strength variants can be as high as 504 milligrams of EPA and 378 milligrams of DHA for each 1,400-milligram fish oil capsule. Why Take Omega-3 Fatty Acids? Omega-3 fatty acids are not the only omega fatty acids we consume in our daily diets. Omega-6 fatty acids are also important. However, while many people consume the right amount of omega-6, they tend to be deficient in omega-3 fatty acids. If you think you may not be getting enough omega-3 from the food you're eating, you may want to consider taking supplements. Prevent cancer. This includes breast, colon, lung and prostate cancer. Prevent and treat cardiovascular issues, including arrhythmia, coronary artery disease, heart attacks and high blood pressure. Treat diabetes and possibly reduce insulin resistance. Treat digestive system disorders, such as Crohn’s disease and ulcerative colitis. Treat inflammatory and rheumatological diseases, such as rheumatoid arthritis. Treat neurological and neuropsychological conditions, including depression and bipolar disorder. Treat respiratory diseases, including asthma. Reduce the risk of eye diseases, such as macular degeneration and retinitis pigmentosa. Reduce the risk of premature births and improve infant development. There have been no scientific studies undertaken on the best time to take omega-3 supplements. One of the well-known and very unpopular side effects of these supplements may, however, be reason enough to take them at bedtime. As a marine-source-derived supplement, omega-3s create the frequent side effect of recurring "fishy breath" and indigestion. If you've experienced this side effect or are concerned about experiencing it, consider bedtime the best time for your omega-3s. This makes it less likely that you'll notice the problem. Why Does Fish Oil Make You Burp? What Are the Benefits of Alpha Linolenic Acid? Can Pregnant Women Overdose on Omega-3?